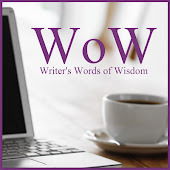 I originally posted the following blog on May 9, 2012. In light of the death of a patient because it was left in a car at a BART station for nearly 7 HOURS while the owner went off for the day to Goddess knows what, I thought it was important to bring up the topic again. The day this Pit bull died? It was in the low 70's and clear blue skies. We weren't dealing with a heat wave, just a sunny day and a dog left in a car that quickly became an oven and an instrument of death. Don't like the thought of a dog seizuring out of control for hours? Don't like the image in your head? Me either and neither did the Good Samaritans who called the police when they saw the dog seizuring in that car. Please, please, please! Don't leave your pets or your children in cars alone unattended while you "run a quick errand." Leaving them home or with supervision and the air conditioner on could save their lives. Read on to learn more about heat stroke. People don't often realize how dangerous warm weather can be for their pets. Not only are there the obvious dangers of being hit by cars, allergic reactions to insect bites, snake bites, and the ever "evil" pieces of weed seed called foxtails commonly found here in California, there is something else that ranks up pretty high in the danger list as the temperatures rise above 70 degrees. Heatstroke is unfortunately a very common occurrence this time of year, and not just for dogs left in cars. Although rare in cats, it has been reported in cases were the feline was trapped in a clothes dryer, left in carriers in hot vehicles or indoors with little or no ventilation. 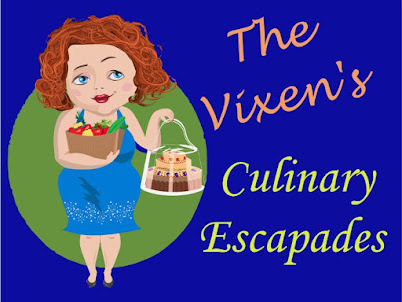 Exotic pets can also be victims. Rabbits, chinchillas, rats and guinea pigs are frequently presented to emergency veterinarians near death because their hutches and cages are placed in areas with little or no shade and are provided with little to no water while their body temperatures soar. For the purpose of this article, I will focus more on dogs, but honestly all the information discussed here can be applied to the other furry friends. There are many ways animals can become dangerously overheated. Dogs have sweat glands only on the pads of their feet and cool themselves primarily by panting. When the air is hot and humid, they cannot rid themselves of the excess heat efficiently. Heat exhaustion or heat stroke is more likely to occur during the first hot days of spring or summer when it's 70-75 degrees than on a 100 degree day in August. Why? Because by the end of summer dogs are used to the heat and typically their owners know enough by then to take it easy with themselves and their pets. It's early on when dogs and people are simply not acclimated to the heat and can easily overexert themselves in the new warm temperatures. Quite a few people travel with their pets when the days are warm, even running errands with their pets "riding shotgun." Unfortunately, unless you plan on leaving the engine running and the air conditioning on full blast, leaving your dog in the car while you run into that store for a "few seconds" is simply NOT an option. Whether or not you leave the windows down or up, park in the shade or not, it doesn't matter. 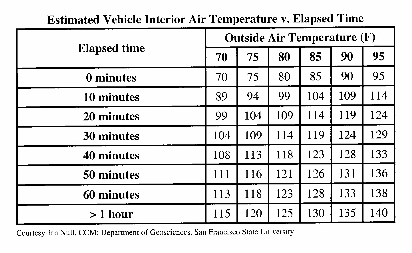 Here's a chart demonstrating how hot the inside of the car can get at various outdoor temperatures. Pretty frightening isn't it? Within 20 minutes your car can be 30 degrees warmer than the outside temperature! Being left inside a car isn't the only cause of heat stroke. Here are a few others. 1. Physical exertion during the heat of the day. This can include going for a run with their owner, playing outside, running along the backyard fence, etc. Heat stroke can even occur inside if the house is warm and the dog becomes excited. 2. Being outdoors in hot weather without access to cool water and shade. Dogs that are tied or kenneled outside can sometimes get trapped out of reach of shade or water. 3. Being a certain breed whose physical conformation makes them unable to cool themselves effectively. Bulldogs, Boxers, Pit bulls, Rottweilers, Boston Terriers, etc all have short noses, small airways and excess tissue at the back of their throats that can make it difficult to get rid of excess heat. 4. Confinement in a poorly ventilated cage or crate especially under a cage dryer such as when a dog is being groomed. 6. Having medical ailments such as heart or airway diseases that can impair breathing. Heart failure, arrhythmias, laryngeal paralysis, pulmonary hypertension, asthma, and bronchitis can all make dogs predisposed to heatstroke. So what are some of the symptoms of heatstroke? Each patient is different, but if you see any of these with your dog on a hot day, it would be wise to seek help from a veterinarian earlier rather than later. 4. Elevated rectal temperature. Normal is between 100-102.5 degrees Fahrenheit. 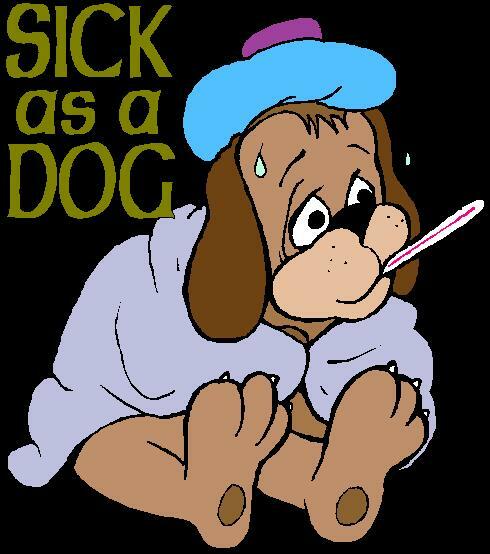 Seek IMMEDIATE veterinary care if the temperature is 105 or higher. Once an animal's body temperature approaches 109 degrees, brain damage is highly likely. DEATH can occur within 20 minutes or in a couple of days from delayed complications such as kidney failure. Now that you've scared the heck out of us, what do we do to prevent our pets from getting heatstroke? It's all basic common sense. Don't leave your dog in the car when the outdoor temperatures are over 70 degrees and definitely not on bright sunny days. Restrict your pets activity during the heat of the day. Don't go jogging at high noon with your dog. It's way too hot for him and for you. Allow your pets to gradually acclimate to warm weather, especially if they are physically active. Always provide access to shade and cool water when dogs are outside Keep breeds at risk, very old, very young or dogs with health conditions indoors in cool, well ventilated areas. If there is a heat advisory issued, please keep all animals inside. If unable to do so, use misters, fans, or wading pools to provide extra cooling measures for outdoor pets. What do we do if our pet does suffer from heat exhaustion or heat stroke? First of all, try not to panic! Your pet needs swift and immediate intervention in order to give it the best chance of survival. 1. Immediately move the dog indoors or to a cool area. If in an enclosed crate, remove the dog from it immediately. 2. Wet the dog down with cool water. Do not use ice water as that will make internal cooling more difficult by constricting blood vessels. 3. Take the rectal temperature. If it's over 105 degrees, transport immediately for veterinary care. Know where the nearest emergency clinic is located. Call en route to let them now you are coming. 4. Do not cover your dog during transport, not even with a wet towel as that can prevent heat from escaping. 5. Offer water to drink during transport, though not to a vomiting patient. Only offer small amounts of water at a time and do not force it down your pet! 6. Transport in an air-conditioned car or lower windows so circulating air can help with evaporative cooling. 7. Stop cooling measures when the rectal temperature reaches 103 degrees so you don't over do it and result in hypothermia. 8. Even if your pet seems to respond to treatment, it is still best to have them evaluated by a veterinarian to check for internal problems. Complications from heat stroke can develop several hours to days later due to organ damage caused by high internal temperatures. The above link is to a graphic that I found today discussing what actually happens to that dog left in a car on a nice day...even with the windows down! I see way too many cases of heat stroke during the nice days here in California. The biggest excuse I hear from people? "I was only gone a few seconds." Yeah, right! You try staying in a hot car with a fur coat for just a few seconds and you tell me how you feel. What you THINK is only a few seconds is actually a few seconds too long when it comes to the health and well being of your dog. Not only is this dangerous for dogs, it's also a problem for cats, rabbits, other small rodents and birds. Why take the chance people! Leave you pets at home when you run errands, or have someone stay in the car with them with the air conditioner running. Did you know that in most cities across the country it is ILLEGAL to leave a pet unattended in a car? Just because you haven't been caught doing it, doesn't mean that it's okay to keep doing it. So please, please, please be a responsible pet owner and keep them safe in ALL weather! I've had experience with death of animals due to heat. Living in Louisiana, we come in contact with the excessive heat from May until late September. Tammy, I hope you don't mind, but your post is very informative and I'd like to share with my followers. Thanks so much! go ahead and share it with as many folks as you can. My hope is to get more people aware of this. In California there is a bunch of people who think that heat stroke can't affect them or their pets because here in the Bay Area it's usually pretty temperate. They are absolutely shocked that a 70 degree day with sun is the days to be more vigilant. My dog and I love to go for long walks when I'm well. She pants quite easily. I provide water for her thought the walk. And we take frequent breaks. But it's warm, I sweat, and she pants. How can I convince people that dogs pant in stead of sweat, and that's she's not dying of thirst? People always tell me. "OH YOUR POOR DOG NEEDS WATER!!" I usually have to stop and rest long before she does, but she is more sensitive to heat than I am. I really don't want to risk her overheating.